Rosetta’s OSIRIS team have produced a colour image of Comet 67P/Churyumov-Gerasimenko as it would be seen by the human eye. As anticipated, the comet turns out to be very grey indeed, with only slight, subtle colour variations seen across its surface. To create an image revealing 67P’s “true” colours, the scientists superposed images taken sequentially through filters centred on red, green, and blue wavelengths. However, as the comet rotated and Rosetta moved during this sequence, the three images are slightly shifted with respect to each other, and are taken from slightly different observing perspectives. Painstaking work is needed to superimpose the images accurately, which is one reason it has taken so long to come up with the first meaningful colour image of 67P/C-G.
“As it turns out, 67P/C-G looks dark grey, in reality almost as black as coal,” says the instrument’s Principal Investigator Holger Sierks from the Max Planck Institute for Solar System Research (MPS). As explained in earlier blog posts for the NAVCAM images, the intensity of the images has been enhanced to span the full range from black to white, in order to make surface details visible. 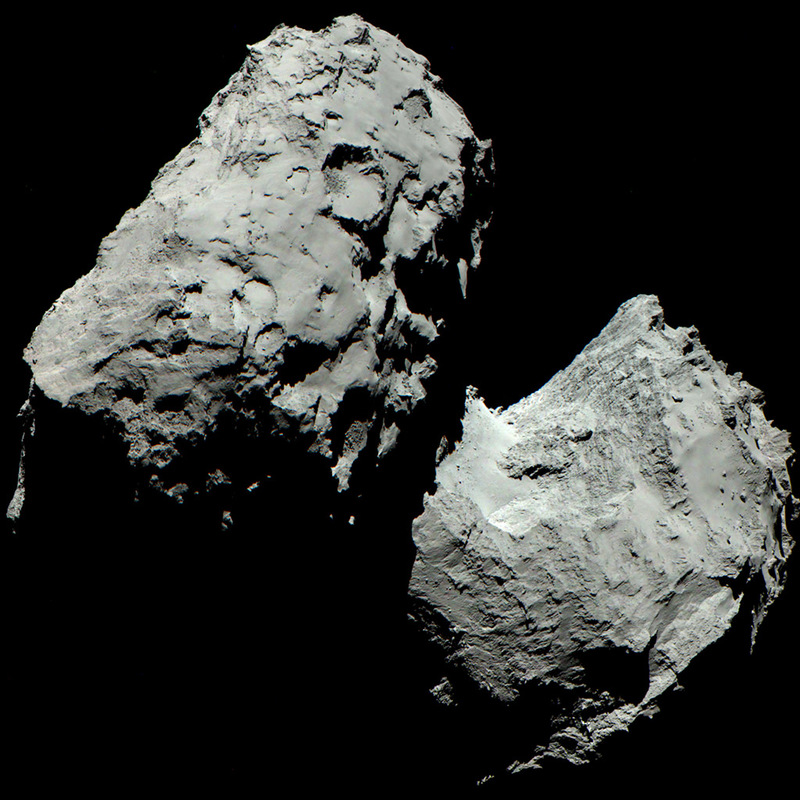 But the colours have not been enhanced: the comet really is very grey. A more detailed first analysis nevertheless reveals that the comet reflects red light slightly more efficiently than other wavelengths. This is a well-known phenomenon observed at many other small bodies in the Solar System and is due to the small size of the surface grains. That does not, however, mean that the comet would look red to the human eye. Natural sunlight peaks in the green part of the spectrum and the response of the human eye is similarly matched. Thus, overall, the comet would look rather grey to the human eye, as seen here. Long before Rosetta’s arrival at the comet, ground-based telescope observations had shown 67P/C-G to be grey on average, but it was not possible to resolve the comet and see any surface details. However, now that OSIRIS is able to take images from close-up, scientists are surprised to see an extremely homogeneously coloured body even on a detailed scale, pointing at little or no compositional variation on the comet’s surface. For example, any ice on the surface should appear brighter in the blue filter, leading to the appearance of blue-ish patches. This image contains no indication of any such icy patches, consistent with observations made by some of Rosetta’s instruments. The overall grey colour of the surface shows that it is covered some kind of dark dust. Further studies using other combinations of the 25 filters in OSIRIS’ arsenal will focus on trying to understand the composition of this dust, by looking for different minerals such as pyroxenes, common in the Earth’s crust, or minerals containing water. OSIRIS will also be trying to detect various gas species in the coma surrounding the nucleus. A little while ago there a lot of site showed another picture of this comet, and is was colored brown. Can you tell me what is happening? You can find the source of that picture via this link. Sensationalism happened, my friend. Started with Geek.com, which saw said picture in a pamphlet for AGU, and jumped to the conclusion it was the real deal, without any fact-checking. Other sites picked from it, appearently not bothering to notice the lack of sources cited. Dunno if that’s true, my friend. I saw the picture on the AGU site as wel. I think that a great part of what you are showing is the noise from the JPEG compression process. The 8×8 pixel blocks are JPG artifacts, features extending over more than one such block mostly not. There may be visible some registering artifacts, too. Sunlight in space differs from sunlight on the surface on Earth. There may be some overall uncertainty of the calibration, since we are very close to grey. Composition may vary leading to variations of pigmentation. And there may be grain size variations and different angles regarding the Sun, surface, and Rosetta/OSIRIS, leading to variations of structural colors. So yes, things get more complicated as you go into detail, and we are working with lossy-compressed images. Very good. These multi-spectral OSIRIS images will help to understand the makeup of the Comet. The spectral signatures of the minerals– the ices, the silicates and the organics– suggest compositional differences of the surface. More later, in reply and in the image captions. “The spectral signatures of the minerals– the ices, the silicates and the organics– suggest compositional differences of the surface”. The write-up explicitly states the exact opposite: “scientists are surprised to see an extremely homogeneously coloured body even on a detailed scale, pointing at little or no compositional variation on the comet’s surface”. No ice patches. Why would anyone have expected otherwise? Fifty shades of Grey, the colors of decomposing Rock. Hi , several days ago I mentioned to observe some change in the visual appearance of the Neck . Now with this latest excellent color image of 67P , I think to see it again . Especially the distance between the 2 bodies seems to me just a fraction smaller . Am I wrong ? probably so , because there´s no notification of it from the Mission Team . Unlike the image Robert mentions, which has appeared and been discussed here before, this image corresponds an awful lot better to the colour image that ROLIS took of the surface at Agilkia. The predominant green tinged dark grey with areas with a dark red tinge to the grey. This it would seem from this OSIRIS image, is true for the vast majority of the surface we have seen up until now. The less dusty “Dark Side” of the comet may be different, but it may just be even darker, without the dust to scatter more light. Holger Sierks stresses that this image is coloured to reflect what the human eye would see. Anyone who has taken digital photos of flowers will know the colour a digital camera records is different from what you see live. A digital camera generally gives equal weight to all wavelengths, whereas the human eye sees far less blue, basically to counteract the overwhelming blueness created by our blue sky. We are also more sensitive to green, because evolution has made our eyes that way, green means water and food. The lack of yellow and orange suggests no sand. Sand is mainly quartz, a mineral/crystal resulting from igneous processes, so it is unsurprising to find none on a freezing cold, small, outer solar system body. If, as some suggest 67P was once part of a larger rocky planetary object, such as Mars, it would surely be covered in sand. This image taken in August is notable for the “blackness” of the “sky”. The last few week’s NAVCAM images, all have an increasingly grey “sky” due to the large increase in dust levels in the coma. You’re probably past the noise threshold of the sensor when you saturate the colors that much. Also, this is a compressed photo. I would prefer to work with a uncompressed high-quality version. I did it myself (saturate the photo) and it seems more like sensor noise patterns than anything real. I’ve seen similar patterns in other photos acquired using the same method of completely grey targets. So, is there color in the comet? Probably a little… but in most of it’s surface it’s close to the image sensor noise limit anyway, so you can’t see it in this photo. Dark grey but anyway gorgeous) Thanks, Emily, and thanks to Rosetta and Rosetta team! ESA team! What are you trying to pull here? 🙂 The colour pictures look greyer than the greyscale ones. I think I can count 50 shades of grey- that’s one hot comet. Thank you, Bill! Not myself having much of a geology background, I am enjoying your analyses very much. Hi Emily. This visual document close several long threads about this issue. We are looking at an object which is mostly H, O,N and C. A ‘honc’ object. Interesting stuff Logan. The density is still twice that given for 67P, but the fact the empty ice structure expands below 55K is very odd. hanks Robin. Extreme dinamicity of shadowed surfaces yells about icy/snowy processes. Lack of updates about this issue could be more about former experiment design [or actual timing]. At least the colours in this image match those seen in the ROLIS image taken prior to Philae’s landing. The green and red tinged grey seen in the ROLIS image would appear to extend over most of the comet. The less dust covered areas seem to be darker, but this may be just due to the small dust grains scattering more light. The mixing of ices with dust and organics does seem to be remarkably homogeneous, apart from in the neck plains where it does seem a fair bit “lighter”. Robin, you seem to be the only one left in the field still stoutly attempting to defend the surface-ice theory (together with your concepts of ‘cryorock” and “cryoboulders” on other threads). “now that OSIRIS is able to take images from close-up, scientists are SURPRISED to see an extremely homogeneously coloured body even on a detailed scale, pointing at little or no compositional variation on the comet’s surface. We can only speculate about precisely which instruments are being referred to since no further information is forthcoming, but I guess at least one of them is VIRTIS, with the “unexpectedly” high surface temperatures (+30°C on average!!!) it has been registering. It is truly remarkable to see how, ever since Rosetta’s arrival at the comet, the scientists have constantly been “surprised” by its every observed feature or property. Much more fun is still to come…. I’m rather disappointed (but not that surprised…) to note that nobody on this thread has yet commented on the more obviously lighter areas in the image. These are to be seen most notably on the rocks at the base of the cliffs forming the rocky canyon which makes up the neck area. 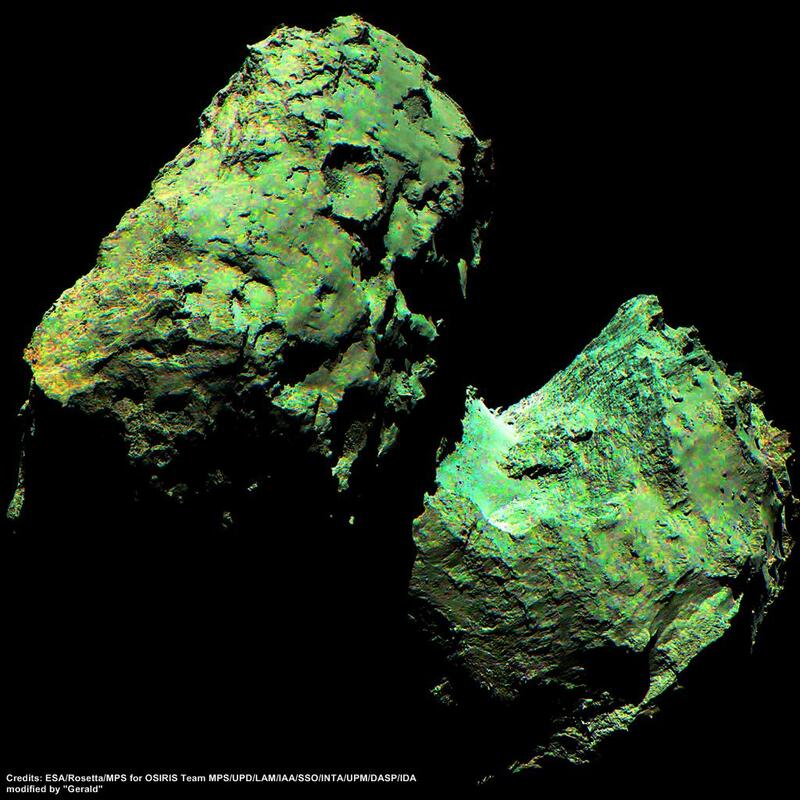 They constitute the most obvious patches of inhomogeneity on the comet’s surface in terms of “colour”. They are not particularly apparent in this particular image, since the main lighter features lie just the other side of the rocky ridge which seems to be barring the entry to the canyon on the nearer side. They are much more spectacular in the recent http://blogs.esa.int/rosetta/2014/12/11/cometwatch-9-december/ image, in which the positively white-seeming features seem to be the crests of rocky ridges and outcrops. As is stated in Emily’s write-up, ice (which the brain immediately turns to as the instinctive interpretation) is now definitively ruled out. I therefore repeat what I, and others, have been suggesting on this forum ever since these features first showed up so plainly in the earliest acquired images (along with other scattered “white” spots and patches on rocks and boulders elsewhere on the surface) that they probably correspond to literal hot-spots caused by electric discharge such as those already detected by the VIRTIS instrument. In the “orthographic projection of the comet’s surface” of the first VIRTIS maps, released on September 8 (http://blogs.esa.int/rosetta/2014/09/08/virtis-maps-comet-hot-spots/), the correspondences between the detected hot-spots and precise individual locations on the comet surface was impossible to establish, at least by the layman. I trust that ongoing study and analysis in the intervening months have now enabled these correlations to be made and that the results will be announced during tomorrow’s AGU presentations. The reality of electric activity focusing on these whiter rocky features could also be established by the detected plasma activity on the surface and probably by many other datasets. I can’t wait for tomorrow’s science update. This should be fun. Thomas, I think you will find that from the day of arrival, when it was intimated that there was little or no ice on the surface and that the surface layer was made of dust mixed with a variety of unknown organics, that I have always referred to ices as being part of the sub surface layer. As for cryorocks and cryobolders, these too are clearly covered to varying degrees in dust and organics giving them their dark colour. As I carefully explained before, there is a possibility that the subsurface material, cryorocks and cryoboulders are in fact a mineral with a very high content of volatile ices. As activity has increased an increasing number of exposed surfaces on ledges and cliffs, cryorocks and cryobolders can be seen with very bright “white” areas, where the dust has been removed by sublimation of ices within the cryorock creating sufficient gas pressure to “blow” the surface dust layer off. Several items of data from the Rosetta science team have shown Water is being emitted from the surface of the comet in amounts well in excess of any possible process other than by sublimation or cryovolcanism. Perhaps you can propose a mechanism, along with Rosetta results as evidence, for how black metamorphic/igneous rocks can turn into “white” rocks over a period of a few weeks. Talks given in Tuscon by the ESA science team stated that there was slightly more reflected near UV and blue light from the neck plains, but the levels suggested it was from Water ice below a surface covering of dust. As you are well aware, what information is given to the general public in the form of press releases, is often simplified and incomplete, compared to the actual results given to the scientific community, through lectures and scientific papers. In my opinion, You Tube videos, press releases and the opinions of publicity seeking, pseudo scientific theologians, is not much of a basis for an informed scientific view. Similarly the +30 degrees you continually refer to as being anomalous was quite clearly explained at the time of arrival as being due to the darker than expected colour of the surface layer. They had calculated an expected temperature for an icy surface layer. The surface layer they found gave a higher temperature because it was not ice. I am sure you are familiar with black materials absorbing and radiating more heat than white materials. Finally I would expect the scientists to say they are SURPRISED. No one has seen a comet this close up before and no one has taken the measurements Rosetta and Philae have before. If they knew what the answers were before they went, what would be the point? They made informed guesses about large scale properties, but smaller scale details were unknown and unknowable. For example, the tails and comas of many comets have been analysed and shown to contain huge amounts of Water, Carbon Dioxide, Ammonia, Carbon Monoxide, small amounts of other volatiles and lots of dust. The comet’s nucleus is made of these materials, but as has been clearly stated by Mark and Matt regularly, they don’t know how all those ingredients are put together and what mechanisms occur to turn that unknown composition into the coma and tails of comets. The Rosetta team does not have to prove and have not designed their mission to do so, that comets are made of volatile ices and dust. That has already been done. Some choose not to accept that evidence, or any other evidence it seems, because it does not fit their theory. In Science, if the evidence doesn’t fit the theory, the theory is either revised, or abandoned. Proponents of EU theory continually claim the experimental results are wrong and never question the theory. That amounts to blind faith and is no different from a religion in my view. If EU proponents wish to comment on and discuss their theological beliefs, there are plenty of other more suitable sites, on which to do so. As you well know, Robin, the Rosetta mission was planned and launched before the Deep Impact mission to Tempel 1 produced its spectacular results. With the observed double flash as the impactor slammed into solid rock at 35000 km/hour and yet managed to eject unimaginable (and totally unexpected) quantities of talcum-powder-quality dust while creating only a tiny crater on the comet’s surface, that mission had, quite to the contrary of what you seem to be claiming, already falsified your standard “comets are made of volatile ices and dust” theory. It was the huge amount of electrical energy discharged by the impact which literally pulverized a few hundred tons of solid rock. If the comet had consisted only of “volatile ices and dust”, the impactor would have simply penetrated deep inside it, with very little visible effect, as the scientists had expected. The observed explosion came, as usual, as a total and utter surprise to everyone except EU proponents, who had actually PREDICTED it. As for your “theology”, it is totally on the side of the Creationist “Big Bang” theory and of all the miraculous entities it has needed to create over the years in order to keep the faithful faithful, as actual observations have started to bring the whole house of cards tumbling down. The aptly-named “Rosetta” mission is finishing the job by conclusively demonstrating the electrical nature of observed cometary behaviour and hence the unquestionable role of electricity in the workings of celestial mechanics. For a little light viewing, here is the latest Thunderbolts video giving the EU perspective on what has been observed on and around 67P: https://www.thunderbolts.info/wp/2014/12/14/rosetta-mission-update-comets-may-not-be-what-we-thought/ These are observations backed up by the analysis of electrical engineers. No “theology”, no “Big Bang”, no “inflation”, no “cosmological constant”, no” dark matter”, no “dark energy”, no “electron stars” or any of the other “six impossible things” that many still “manage to believe before breakfast”. Just observation and analysis through pattern recognition, i.e. just the basics of the “scientific method”. Why is the comet green when saturation is enhanced? Those lighter/whiter areas on the neck have never been so clearly evidenced. They seem to positively glow. There is clearly A LOT OF serious glow-discharge activity going on there…. No, the bright-looking parts are just a little less black. He has significantly reduced contrast to accurately reflect the true albedo of the comet’s surface. The “lighter” patches in the neck region are certainly not “just a little less black” as you claim. Despite considerably reduced contrast, they shine positively white like beacons in the night. They are now shown, with reduced contrast, to be clearly much whiter, for example, than the smooth features on the head and body lobes which some commentators on the forum have likened to “snowdrifts”. Given that these much whiter areas correspond precisely with those areas of the comet which are emitting the overwhelming majority of the observed dead-straight dust-jets, it seems difficult to avoid the conclusion that there is a direct causal relationship between them. EU proponents take this as direct prima facie evidence of sustained electric glow-mode discharge activity emanating from these whiter areas of the neck region. The raw images are routinely brightness-stretched to exploit all grey scales from white to black. This means, that dark grey is mapped to white. It’s difficult to remove the white tone without adding ugly or misleading artifacts, when post-processing. I came to exactly these considerations with my own processing of this image. Interpreting these practical processing considerations as electrical discharges is no way evidenced. Correlating active (sublimation) regions at the neck with slightly higher albedo appears justified to some degree. But again, inferring plasma discharges that way is not at all justified. We would see discharging also in the shadow, and not a sharp boundaries of the shadows, since any electric activity wouldn’t be strictly coupled to illumination by the Sun. The closest correlation would occur due to photoelectricity by uv light. But any potential discharging this way would also accur in areas which are not illuminated, since dark areas would be charged negatively. Charging by the plasma due to solar wind would also be negatively in the areas shadowed from solar wind. Any discharges caused that way would occur in illuminated as well as in shadowed areas. But there is no perceivable evidence for this effect in the images. Plasma discharges would excite atoms and result in well-known spectra, perceivable as specific colors. Again no evidence. Strong electric overall charge of the nucleus would disrupt the surface or at least immediately repulse all dust. Instead we observe gradual release of dust. Loads and loads of evidence, that the EU proponents are wrong. But don’t understand me wrong: There are certainly some electric effects. Photoelectricity due to uv is physically well-based. Sputtering due to ion impacts by solar wind would expected, too. Large plasma discharges on large planets, like Saturn or Jupiter (aurora, and lightnings) are reasonable. If EU proponents would focus on actual physical phenomena, they could add contributions of some value. Insisiting on nonsensical statements instead, doesn’t help. Sunlight looks white on sea level. It would probably look slightly greenish in outer space. This slightly greenish light makes a reddish-grey object (like the nucleus) looking greenish. We now know that the white patches on the surface and on the rocks are not ice. It is possible therefore they could be electric hot spots but we only have another 24hrs to wait before we know for sure, so lets sit back and enjoy. We dont yet have any information abouts whats underneath the surface apart from the fact that deeply cut valleys and scarps look as homogenious as the surface. So its still possible we will find surprises under the surface. Maybe there are ices there, or water or hollow or rock. So we may as well sit back and enjoy the presentations today. We should then know pretty much what we are dealing with. Of course there will then be more questions. It’s not possible that these are “electric hot spots”. Philae already debunked that theory.